It has been a controversial year for NBA All-Star, Jimmy Butler and former team the Minnesota Timberwolves organisation. 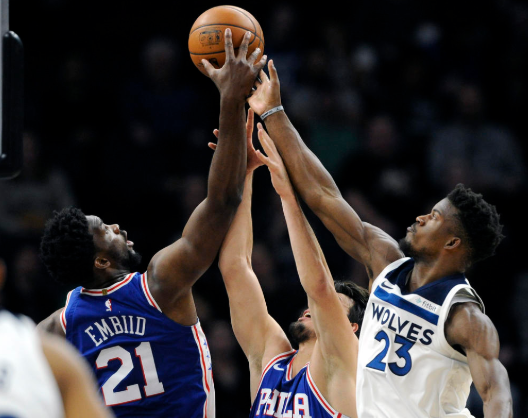 But following a meeting with Timberwolves, and the front office of the Philadelphia 76ers, all issues were resolved and Butler was traded to the 76ers. This altercation began when Butler complained to his coaching staff and the media that he didn’t enjoy playing with his teammates, Karl Anthony Towns and Andrew Wiggins, stating that, they are more talented than I am yet they lack a winning mindset. This obviously created some friction in the franchise, and rumour had it that the locker room became too tense. Head coach of the Timberwolves and Butler’s friend, Tom Thibodeau tried to resolve the issue, but to no avail. things really became interesting when Butler showed up for team practice. You fu__ing need me, you cannot win without me. The NBA season officially kicked off mid-October and ever since then, Butler has been reluctant to play for the Timberwolves, insisting that he wants to be traded. This problem was resolved on Saturday evening as it was confirmed that he had been traded to the 76ers, to team up with Cameroonian sensation, Joel Embiid, and Australian superstar, Ben Simmons. This team up is projected to be a top eastern team, and practically a championship contender. Joel Embiid, is arguably the best Center (Big-man) in the league, and Ben Simmons is last year’s rookie of the year. Butler himself, is also a very accomplished player, having 4 all-star appearances under his belt, and a first team all defence, making him on of the top five defensive players in the league. Fans of the game are excited at the prospect of these three playing together, and the possibility that they could become champions.